Peter Riedemann was a prominent early Hutterite leader. He spent years in prison, during which time he wrote many letters and two confessions of faith. He was also a prolific hymnwriter. This hymn is #470 in the Lieder der Hutterischen Brueder; translation by Peter Hoover. Used by permission.—AVS. The Lord God is my strength and shield, the fortress of my trust. He never leaves me without the comfort of his Holy Ghost. Though tribulations try me to the limit and anguish fills my soul he gives me love and patience, willingly, to overcome. I will trust and believe in the Lord. He will not break his promises. He purifies my heart, gives me a glad conscience, and the power to overcome my fleshly desires. With compelling temptations and naked lust the wicked one lures my soul. But the Lord gives me victory! He lets me overcome the devil and all things that hinder me. Though they burn me with fire and torture me to death I will testify for my Saviour with irresistible joy! Look, the bridegroom is at hand! He stands by the cross and waits on his church, the bride. Great comfort he will give her in the land to which they will go. Pleasures unending that no one can describe await them there. So let us go willingly through the narrow door! Let us squeeze our way into it, leaving the sights and sounds of the tempting world behind us to gain Christ! Even though we must suffer shame, persecution and death for Christ, it is worth it to live forever with him. July 16, 1740 was probably just another day for the little port town of New York. It was a growing town, having doubled its population during the last 40 years—from about 5,000 to 10,000. It was not yet New York City. Into these 10,000 inhabitants stepped a young man named Christian Henry Rauch. He was a man with a mission; a mission to change the world with the gospel, one sinner at a time. Christian had no quixotic dream of converting the whole world. But he did know the power of Christ could change whosoever will. And that included the so-called “red” men of North America. After all, if Christ could change a European, He could surely change a Native American … they were all made of the same stuff and were all from the same original descendent. Stepping off the ship, Christian really had no idea where to begin his mission. He had been chosen from a group of 12 candidates and commissioned by the Moravian Brethren Church to go to New York to “preach the gospel to the Indians.” When his foot touched the dock, he was walking by faith that God would lead him to the right person. He didn’t know a single soul in New York, nor where to begin to find the people to whom he had been sent to minister. Christian thanked them for the information but didn’t let it discourage him. He just kept praying. Not too many days later Christian heard that a group of Mohican Indians were in town to complain to the authorities that the white people were encroaching upon their lands up the Hudson River. Christian looked them up, and to his great surprise he found he could converse with them in Dutch, although imperfectly. But a bigger problem than the language was the fact that these Indians—described as ferocious in appearance and manners—were seriously intoxicated. He had to wait until they recovered enough from their drunken state to converse with them. Thus the missionary had his first meeting with the people for whom he would pour out his life. When sobered up, he spoke with Tschoop and Shabasch, both of whom were sachems, or tribal chiefs. Tschoop was a middle-aged man by our standards, but “old” for his time and place: he was somewhere around 40 years of age. Somewhere along the line, Dutch traders had nicknamed him Job, which name his fellow Indians had made into Tschoop. The name stuck. Why he had been called “Job” is unknown: perhaps it had to do with Tschoop being a crippled man and quite an unhandsome sight—different sources mention his great physical uncomeliness—like Job in his afflicted state. Another version is that he earned the name from his natural wisdom. But unlike Job of the Bible, Tschoop was a servant of alcohol. In fact, he was known to be one of the worst of his people for succumbing to the firewater that the white man had introduced to the red man. So much so that when Christian went to visit his two new friends the second time just a few days later, both were so drunken that they could neither stand nor talk. But he had managed earlier to get their permission to return with them to their village to be their teacher in spiritual matters, so he remained undaunted. However, in the confusion of meeting up with them at a predetermined place, they returned home without him when the time came for them to leave. Christian found out that his new friends lived at Shekomeko, a small Indian town near the Connecticut border, and so started out for a visit. He arrived on August 16, just one month after landing in New York. And the story of a revival began. But before the revival, great testing had to come. Christian rose to the occasion by simply pressing ahead. Day by day he visited in their huts and tried to tell them his message. But things got worse before they got better. He was refused in many of their homes and wandered from village to village trying to find a receptive ear, and finding none. In fact, Tschoop even looked for an opportunity to shoot Christian, but the right moment never appeared. Shabasch simply tried to avoid him. But several things would not let Tschoop rest: that one word he remembered and dreamed about, “blood,” the great peace which Rauch possessed, and the good news of deliverance. Later another preacher came and began to teach us, saying, “You must not steal, lie, nor get drunk.” We answered, “You fool, do you think we don’t know that? First teach yourself and your own people to stop doing those things! Who steals, lies, and gets drunk more than your own people?” And we sent him away also. It was the message of freedom from sin that seemed to strike deep into the heart of Tschoop and his people. They already knew there was a God. They knew that this God wanted them to live morally and uprightly. And so they had sent home the earlier missionaries who came to tell them what they already knew. But here came a missionary with a different message … the message of deliverance, of a changed life with power over sin through Christ! And freedom came by blood? Tschoop was confused. “Why do you talk about the blood with such joy in your heart?” ask Tschoop. “Because it is the blood of your Creator, who came to die and cleanse you from your sin,” replied Christian. “But how can blood cleanse from sin?” came the honest question. “If you love Him, the blood will work upon you,” explained the missionary. “But I am so given to drink,” protested the debauched man. This man cannot be a bad man; he fears no evil, not even from us, who are so savage and cruel, but sleeps comfortably, and places his life in our hands. I might kill him, and throw him out into the woods, and who would even know it? But this gives him no concern. I have been a poor, wild heathen, and for forty years as ignorant as a dog. I was the greatest drunkard, and the most willing slave of the devil; and as I knew nothing of our Savior, I served vain idols, which I now wish to see destroyed by fire. Of this I have repented with many tears. When I heard that Jesus was also Savior of the heathen, I felt it to be my duty to offer myself with soul, body, and spirit to Him. But my nearest relations, my wife and children, were my enemies; and my greatest enemy was my wife’s mother. She told me that I was worse than a dog if I would not believe in her idol. But my eyes being opened, I understood that what she said was nothing but folly, for I knew that she had received her idol from her grandmother. It is made of leather, and decorated with wampum. Since she is the oldest person in the house, she made us worship it, which we have done, until our teacher came and told us of the Lamb of God who shed His blood and died for us ignorant people. I was astonished at this doctrine, and as often as I heard it preached, my heart grew warm. I even dreamed that our teacher stood before me and preached it to me. Now I feel and believe that our Savior alone can help me by the power of his blood, and no one else. I believe that He is my God, and my Savior, who died on the cross for me, a sinner. I wish to be baptized, and frequently long for it most ardently. I am lame and cannot travel in winter, but in April or May I will come to you. The enemy has often tried to make me unfaithful; but what I loved before, I consider more and more as worthless and sinful. I am your poor, wild Tschoop. When Tschoop surrendered his will to Christ, the blood flowed … from Christ to Tschoop’s heart, rebirthing his inner man. The Moravians had a different view of the blood atonement than the popular assumption that the blood of Jesus is like the pagans’ offering to appease the wrath of the angry gods. You know, like, “The gods are angry! Quick! Offer them a sacrifice to appease their wrath!” Not so, in Moravian theology. According to Zinzendorf, the wounds of Christ were the key to rebirth. When the wounds were opened on the cross, blood flowed out … that is, the life of Christ. This flowing blood symbolized the Holy Spirit pouring out of the Messiah, which was then sprinkled into the spirit of sinful men—men like Tschoop—cleansing them of all sin. In short, the blood atonement was like a spiritual blood transfusion. The blood of Christ, His Spirit, would flow out of Christ and into a drunk, sobering him up. This life of the Messiah would flow into vengeful men and turn them into gentle, forgiving gentlemen. This Spirit, flowing out of the wounds of Christ, would take perverted men and turn them into faithful husbands and fathers. This blood, flowing out of Christ, would cleanse all selfishness out of fallen humanity. Indeed, there was—and still is—power in the blood of Christ to cleanse from all sin! Tschoop would never be the same again! The old drunken, carousing, self-centered warrior was turned into a gentle, moral, and sober follower of Jesus. Not very much later, Shabasch experienced the grace that changes sinners into saints. And others followed, not only in Shekomeko, but in the neighboring villages of Wachquatnach and Pachgatgoch. On Februrary 11, 1742, Christian had the privilege of baptizing the first three Native Americans into the fold—Shabasch being one of them—near Oley, Pennsylvania. They had travelled to Pennsylvania for the occasion, and there Christian was ordained as a deacon, and then the three Indians were baptized by him at a meeting attended by quite a number of different denominational leaders. This baptism was a moving sensation among the Pennsylvanians. But Tschoop could not attend since he was too crippled to make the journey. However, on April 16, 1742, Tschoop also received baptism at the hands of Christian, back in Shekomeko. His teacher had repeatedly told him that no one but the crucified Savior could help him, and that He was always ready to do so, if he would only submit. But he had loved so many other things, and he despaired of giving them up. He had stuck fast to the world, was full of self-love, making a god of his belly. He also feared the reproach of man, and yet convinced that unless he surrendered his whole heart to the Savior, he would be damned on account of his unbelief. But now I am happy, for I know that our Savior has done so much for me; I am now as much humbled as I was sorrowful. As soon as I felt that I loved Him, I immediately wished for brethren who loved Him also. Therefore I love my brother Rauch, and you, and all my brethren here, and all brethren everywhere, even those whom I shall never see in this world. All who love the Lord Jesus, I love and salute. I rejoice more and more because our Savior makes others likewise happy, and not me only. I am always glad when our Brethren make known to us the Word; it is sweet to my taste, and I attend closely, that I may be as the Bible directs. And it is easy. There are men who say, ‘The Bible is a hard book.’ But I have not found it so; it is all sweet and easy. I therefore wait patiently until I come to the hard part. Since I so far only know it easy and sweet, and can say nothing more except that I feel the power of our Savior’s blood. Signed—John, your brother. It was truly delightful to see the poor Indians coming from places 25 miles distant to hear the new preacher, who, as they expressed it, spoke of God who became man, and loved the Indians so much that He gave His life to save them from the devil and the service of sin. The faith of the Indians in our Lord Jesus Christ, their simplicity and natural deportment, and their experience of the grace procured for us by the sufferings of Jesus have impressed upon my mind with a firm belief that God is with you. I thought myself seated in a company of early Christians. They attended with great seriousness and devotion; their eyes were steadily fixed upon their teachers as if they would eat their words. Tschoop was the interpreter and behaved himself in the best manner. I esteem him a man anointed with grace and Spirit. The text of Scripture, ‘Jesus Christ, the same yesterday, today, and forever’ appeared to me as an eternal truth when I watched the venerable patriarchs of the American Indian church sitting around me as living witnesses of the power of Christ and His atoning sacrifice. Their prayers are had in remembrance in the sight of God and may God fight against their enemies. May the Almighty give to you and your assistants an open door to the hearts of all the heathen. The nearer we approached to Shekomeko, the more veneration we found among all ranks of people for the great work of God in that place. The Justice of Peace at Milsy accompanied us, and declared that he would rather allow his right arm to be cut off than force the brethren to adhere to the Act passed against them, for he was thoroughly convinced that the grace of God had, by their means, wrought miracles in Shekomeko. But when we arrived and were witnesses of it, then, dear brothers, dead indeed must be the man who could refrain from shedding tears of joy and gratitude for the grace bestowed upon this people! It is impossible to express what is felt here; God has done the work. As we rode into town we met a man standing beside the road with a most remarkable countenance. We immediately thought of Tschoop and addressed him by name, and found that we were not mistaken. He received us with great kindness and brought us immediately to the missionaries. Then the venerable elder, Abraham, came to see us and greeted us, and though he was marked, after the Indian custom, with a figure of a snake on each cheek, yet the grace of our Savior was so visible in his countenance, that we were struck with awe and amazement. The rest of the assistants came one after another and gave us a welcome in the most affectionate manner. Indeed, there was not a single one of the congregation that did not express joy at our arrival. They appeared altogether as meek as lambs. An Indian who had deviated from the right path wished to be readmitted, but the brethren could not trust him as yet. When we afterward held a lovefeast with all the baptized, 70 in number, he came likewise, stood at a distance, and looked upon his brethren with repentance and contrition in his countenance. We called him forward; upon which he went and sat down in a corner. During love feast the presence of the Lord was powerfully felt. I spoke of the happiness granted to us by virtue of the sacrifice made by Jesus Christ, appealing to their own experience, and they affirmed what I said to be true. Afterward, Isaac exhorted the brethren to be continually humble and low in their own eyes; never to forget the sufferings and death of Jesus, and not only to think of it in Shekomeko, but in the woods and when out hunting. We closed our love feast with prayer and supplication, and with tears commended these precious souls, and our venerable brethren who have labored among them, to God, our almighty Savior. Conrad Weiser had written, “may God fight against their enemies.” And enemies arose, although the Indian converts had laid down the war hatchet to follow Jesus. The “enemies” were the rum traders. Like the men in the book of Acts who were losing business because of Paul’s preaching, the rum traders started losing business at Shekomeko and the surrounding villages. And they were upset. In an effort to counteract the revival, they started some rumors in the area. One rumor was that the Moravian missionaries were actually Roman Catholics in disguise, and they intended to turn the Indian nations to Rome. This, of course, did not go over well with the white population in the area, who were basically either Reformed or Anglican. Another story that got started was that the missionaries intended to sell the Indian children as slaves. As well, the Moravians were also reputed to be in league with the French, with 3000 arms ready to distribute to the Indians against the English. That may be so. But I know what they have told me, and what God has worked within me. Look at my poor fellow Indians lying there drunk at your door. Why do you not send privileged teachers to convert them? Four years ago I also lived like an animal, and none of you troubled yourselves about me. But when the brethren came they preached the cross of Christ, and I have experienced the power of His blood, so that sin has no longer dominion over me. That’s the kind of teachers we want. Disobey Jesus to save the mission post? Eventually the rumors did their intended work. The town of Sharon, near Shekomeko, remained under arms for a whole week, and some of the colonists fled the area. The colony of New York passed an Act in 1745 that basically forbade anyone to do mission work among the Indians within the colony unless they would swear to two things. One, that they “rejected transubstantiation, the worship of the Virgin Mary, purgatory, etc,” and two, that they were loyal to the British king. The Moravian missionaries were not Catholics, and neither were they opposed to the king. But … the “problem” was that Jesus had told them not to swear oaths. So they were stuck with either disobeying Jesus’ explicit command, or abandoning their mission outreach at Shekomeko. They chose to obey Jesus. The converts in the villages held out for a few years, but circumstances eventually forced them to move on. White settlers made the claim that the ground upon which Shekomeko was built was not actually Indian land. Furthermore, a rumor was started that the Indians of Shekomeko were in league with the French. So great was the affect of this rumor that the inhabitants of Rhinebeck demanded a warrant—refused to them, thankfully—to kill all the Indians at Shekomeko. As much as they loved their village, the villagers “saw the handwriting on the wall.” In April of 1746, the first 10 families packed up and headed out to seek asylum near their teachers in Pennsylvania. There, new villages were started, close to Bethlehem. Friedenshutten [shelters of peace] and Gnaddenhutten [shelters of grace] became Christian Indian villages, with refugees from Shekomeko and surrounding villages, along with converts from other Indian nations. Each family was given a plot of ground, and soon beautiful fields graced the valleys. The inhabitants also lived off of the wild game, with up to 15-20 deer being harvested daily, as well as wild berries, nuts, and honey. The congregation met twice daily. Translation work was in process. New believers were taught. Strict and faithful discipline was observed. Cleanliness and orderliness prevailed. And alcohol was banned entirely from the Christian Indian villages. The number of the Indian converts increased to about 500, and the chapel had to be enlarged only three years after it was built in 1746. Widows and orphans were cared for. The love of war was replaced by harmony. The story of the Moravian missions to the American Indians continued on for many years. By the time the eastern Indian nations had been pushed—what little was left of them—all the way to Kansas in the 1800s, many such villages had been built in Pennsylvania, Ohio, Michigan, and Ontario. But not without price. Gnaddenhutten, mentioned above, was raided during the French and Indian War and several of the missionaries were killed. It was soon abandoned, and eventually the Indian converts found other places to settle further north and west. In Ohio, another village also named Gnaddenhutten suffered a massacre in which over 90 nonresistant Indians were mercilessly butchered to death by white colonists during the Revolutionary War. The stories of these villages—as worthy as they are for retelling—are too long to include here. Tschoop became a translator and instructor of Indian languages and customs at Bethlehem for new missionaries. But his story is not long. It is the story of the smallpox among the Native Americans. Tschoop became a victim on August 27, 1746, along with over a dozen other neighboring Indians at the time. Smallpox (and similar diseases) is thought to have reduced the Native American population from several million, at the “discovery” of America by the Europeans, to several hundred thousand by the mid-1800s. Whole villages were almost totally wiped out by the dreaded disease to which the Indians were not resistant. Very few Native Americans who contracted it survived. Tschoop lies buried along with 58 other Native American converts—from about eight different tribes—in God’s Acre in Bethlehem, Pennsylvania. The cemetery in Moravian communities was called God’s Acre because the Moravians saw the dead bodies “as seeds being planted, awaiting the resurrection to the final judgment.” When the trumpet sounds, all those dead bodies will “sprout” like so many seeds for the Savior! There shall be one fold and one Shepherd. John x. 16. Frederic was in New York from the St. Thomas (West Indies) mission, which is where the first two Moravian missionaries, Leonard Dober and David Nitschmann, had gone a few years earlier. Neither Dober nor Nitschmann had stayed long on the island (Nitschmann a few months and Dober about two years). The Dutch had founded “New Amsterdam” as a trading post in 1625, but had ceded it to the English in 1664, who promptly renamed it “New York.” Thus the Dutch language had been introduced among the native population. Near present-day Pine Plains, NY. The Moravians were not the first to preach to the American Indians, nor the first to have converts from them. But the Moravian Brethren were eventually the most successful in making disciples of Jesus—men and women who followed Jesus’ teachings—from among the Native Americans. Quite a number of nonresistant Christian Indian villages were formed during the following decades. The center of the Moravian outreach in North America. At his baptism, Tschoop had been given the name John. His original Indian name was Wasamapah. Thus Tschoop was known by three names. Returning to the theme of the flowing blood being a symbol of the life (Spirit) flowing out of the Messiah to enliven sinners, this phrase and sentence is like “apples of gold upon silver platters” when thus interpreted. Conrad was an official government agent to the Indian nations, helping in treaty negotiations and land purchases. His homestead, near Womelsdorf, PA, is now a State Historic Site. Conrad also was a member, for about six years, of the Ephrata Cloister, at Ephrata, PA.
 Abraham [Shabasch] had evidently been ordained as an “elder” [older brother, to be a spiritual counselor to the younger] and the others here mentioned were “assistants” of some sort in the Moravian system of church administration. It is to be noted that the Moravian use of some terms like “elder” does not equal what we normally think of when we use those same terms today. It is to be remembered that the Moravian missionaries taught their converts to be disciples of Jesus … these Indians practiced the Sermon on the Mount! An indication that church discipline was practiced at Shekomeko. Not some emotional experience, but the experience of being delivered from the power of sin! Otabawánemen, one of the first three Indians baptized at Oley, whom had been given the names Abraham, Isaac, and Jacob. The original stone would have probably only had his name and possibly the date of his death. It was replaced with the one mentioned here. As of the writing of this article, the stone mentioned here has also been replaced by another. On a side note, Christian Rauch died at Old Carmel, Jamaica, in 1763. The story of his missionary life at Shekomeko is only the beginning! Originally published in The Heartbeat of the Remnant (November/December 2012), 400 W. Main Street Ste. 1, Ephrata, PA 17522. Onophrius Griesinger and Leonhard Lochmair (formerly a Roman Catholic priest) were sent by the Hutterites living in Moravia as evangelists to South Tyrol. As had happened with several evangelistic teams before them, they were hunted down and arrested by the authorities. Lochmair was arrested first, in April 1538. He was imprisoned and examined and recanted. Before long, however, he repented of his weak wavering and declared himself no longer willing to recant his faith. In the meantime, strong efforts were made by the government to track down Onophrius. On May 20, 1538, fifteen strong men were ordered to find him. It took until August 28, 1538, for the authorities to finally catch up with him – with the help of an infiltrator who betrayed Onophrius. Onophrius was tortured twice, but refused to confess to knowing of any plans among the brotherhood for rebellion against the government (of course, they had no such plans). The local officials wanted to execute Onophrius secretly before dawn, but representatives of the emperor were there to ensure that he was sentenced to a public burning. On October 31, 1538, Onophrius was executed for the sake of the truth of the Gospel. Oswald Schuster, another Anabaptist, was present at the execution. Just before Onophrius was put in the fire, he came forward and shook Onophrius’s hand. He was quickly arrested but later escaped from prison and fled to Moravia with Onophrius’s widow. Onophrius’s execution was a hard day for the officials. The locals were not pleased with the fact that he was being executed. Mercenaries had been hired for crowd control, but even they were angry with the authorities for what was being done to Onophrius. There was a heavy rain that day, which dampened the fire and prolonged the torture of death. The captain of the mercenaries demanded that Onophrius be beheaded, a more merciful method of execution. 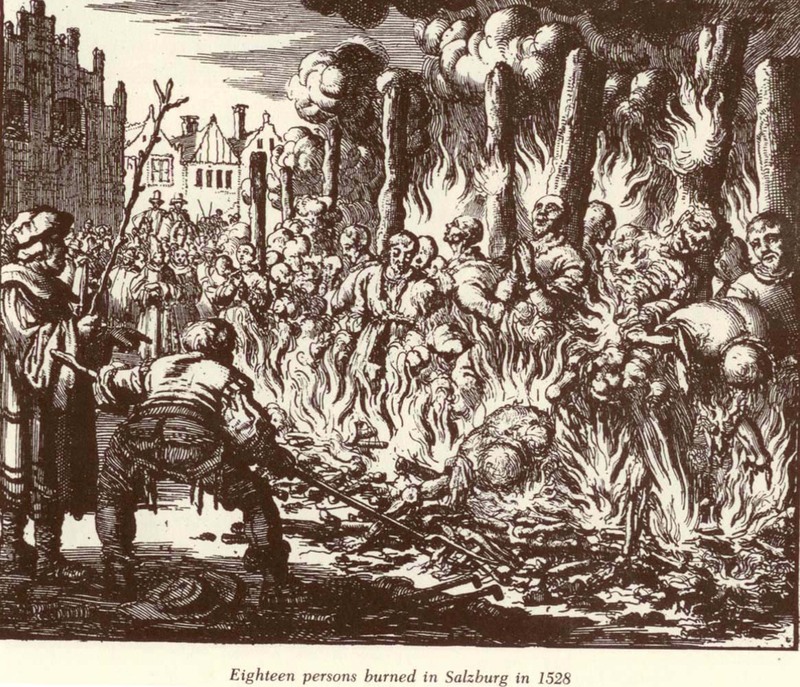 The authorities would not go against the Emperor’s orders that Anabaptists were to be burned alive. However, they did bring some dry wood to bring a quicker end to Onophrius’s suffering. Onophrius did not die in vain. The provost in charge of the execution, after seeing Onophrius die and being greatly moved at his integrity and steadfastness, raised his hand and swore an oath that he would never again sentence another Anabaptist. The captain of the mercenaries, who had demanded a more merciful end to Onophrius’s sufferings, later went to Moravia and joined the Hutterites. In the meantime, Onophrius’s fellow prisoner, Leonhard Lochmair, lay in prison. He was finally beheaded in late 1538. Originally published in The Witness, January 2012. Two boys push their sticks through the July dust, pretending—as boys are wont to do—that the sticks are plows and horses turning over the rocky Virginia mountain soil in preparation to plant the corn. The morning sun is rising high over the ridge now, and the heat of the day is just beginning to show itself fierce when the sound of horseshoes clashing with rocks cause the boys to stop their plowing and glance down the rock-strewn path toward the creek below. A shaggy ol’ mare appears with a black-coated man, in a large black hat, on its back. “It’s Johnny Kline!” they blurt out, almost in unison. And with that, two pairs of bare feet speed up the path toward the log cabin. Bursting through the open front door, they exclaim the news, as only little boys can do. The other children look up from their various duties and amusements, and spontaneous smiles spread as if a contagion has hit the home. The mother quickly sizes up the house and begins to straighten the furniture a bit—as mothers are wont to do—and commands one of the boys to run and tell father, who is in the field behind the house hoeing corn. “OK, son, I am coming.” And with four more quick slashes at some especially pernicious-looking weeds, the father shoulders his hoe and strides towards the cabin below, his quick gait belying his own excitement at the news. Visitors in the “hollers” of the Virginia mountains were rare, and the mere fact of someone coming up the path would have caused a stir in the household. But when that familiar old mare and that familiar black coat and hat, with that familiar white hair hanging out from under it, made their appearance, it was nearly impossible for the children to keep from smiling and giggling with excitement as they bounced from window to window, peeping in embarrassed joy at the visitor as he dismounted and tied the reins to the rail, then loosened the saddle on ol’ Nell. The mountain people of Virginia (during the Civil War, the western counties of Virginia would break away from Virginia and call themselves West Virginia) were an independent lot: tough as hickory saplings, hard to get to know, “uned’rcated,” and suspicious by nature of strangers invading their hidden “hollers.” But Johnny Kline had travelled their rocky paths for many years now, and by his kind and gentle nature had won the hearts of many of these backwoods folks, to the point that they almost revered him. No, he would refuse to be called “Reverend,” but due to his repeated visits in these almost forgotten places, the mere mention of his name would strike a genuine reverence in their hearts for many years after his death. The reason was quite simple: Johnny Kline cared about them. And they knew that. John Kline was born June 17, 1797, in Dauphin County, Pennsylvania. He was the great-grandson of Elder George Kline. His great-grandfather had emigrated from Germany as a Lutheran minister and taken up residence in New Jersey where he met the Schwarzenau Brethren, later called the “Dunkers,” the “German Baptists,” or the “Church of the Brethren.” George joined the fledgling movement and was later ordained among them. In those early days, zeal for revival was fresh and the Brethren won converts—like George—into their movement. But as usually happens, the following generations lost some of “the cutting edge” of the kingdom message, and too many of them settled into the formalities of going to meeting, keeping the ordinances, and maintaining an outward separation … all of which are very good and right. But the kingdom of God is more than keeping ordinances and attending preaching services. The kingdom of God is also being delivered from a self-centered life … into a life of service to others. More than one hundred years had passed since the German Baptist revival had begun, and too many were sleepy. The frontiers of America were opening up and there were rich farmlands to clear and houses and barns to build. It was oh, so easy to slip into the routine of “church,” and let the extension of God’s kingdom take a backseat to the everyday pressing needs of frontier life. … as to the progress of the church, it is but little I think, and it is owing to the coldness of our brethren. We are all too much for the world and accumulation of worldly things. This brings darkness and a gloss over the Gospel, and of course makes people think that they are just as good as any other Christian. It is true that according to morality and honesty, they are often equally as good, but large numbers of our children do not have, as it were, any parental rule. They are taught more how to rise in the world then how to love Christ and deny themselves. This is the way things are going. They generally have a taste for the world in the things of the world. But, oh, how will it be with these parents who speak so little with their children of Christ and self-denial, who only have the world at heart? I am fearful, oh I tremble, when I think of it, and my heart weeps over the daughter of Zion who has defiled herself. Did he ever wonder if fourth generation churches—sleepy, though doctrinally orthodox—could be revived? I certainly have wondered that. In fact, it is probably more correct for me to say that I seriously doubt that will happen, in the majority of cases. John simply put his hand to the plow … and became an instrument of revival. Just because very few in his church were reaching out in evangelistic endeavors did not stop him from starting an endeavor. Rare as it is that a sleepy, fourth generation church revives, John proved that it can happen! John lived on a farm at what is now Broadway, Virginia. Broadway is located in the Shenandoah Valley, nestled up to the Appalachian range on the west. The Valley was comfortably settled and economically prospering in John’s day. But the story changed as soon as one followed the north branch of the Shenandoah River through a narrow gap—Brock’s Gap—in the first range of hills. In these rugged mountains lived the poor folks, those who could not afford the rich farm lands of the broad Valley, much less the lands of the coastal plains further east. These folks were “mountain people.” They were poorer, less educated, less respected, and—in the beginning of John Kline’s ministry—practically unchurched. We found some of the members in a very poor condition. One sister, in particular, moved my feelings deeply. Her husband is somewhat dissipated and does not provide for his family as he should. She is the mother of three small children; and, judging from their present appearance, they have undergone a good deal of suffering for lack of food and clothing. None of them have any shoes; and the thin coverings they have on are so patched and darned that one can hardly tell the kind of goods they were originally made of. I inquired how they were off in the way of food. She replied that they had about a peck of corn meal in the house and several bushels of potatoes buried in the garden; and she reckoned they could do right well till she could get some more washing and other work to do. I gave that patient, uncomplaining sister three dollars out of my own pocket money. “It is more blessed to give than to receive.” There is a day coming when we shall more fully realize this truth than now. It is not hard to start a bad habit. In fact, all we have to do is start coasting along in life, and living a self-centered life will become as habitual as breathing. But John Kline started habits of service to others. One of these habits was to make an evangelistic trip into the mountain counties of Virginia (now West Virginia), on a regular basis. In the beginning he sometimes went alone. In later years he usually took another brother with him, as his good habits began to wear off on others. These trips were usually carried out in the fall of the year, and lasted several weeks. He would mount his faithful Nell—she took him an estimated 30,000 miles in her life, equal to more than one time around the world—and head up into the hills. In all my visits I make it a point not to leave a house without making an effort to speak on the subject of religion, and say something that may leave an impression for good. At the time of his death, the results of his labors could be seen in the formation of a number of Bible-practicing “Dunker” churches in those rugged hills. A baptism here, and two over there, and later another one here again. And over the years little congregations would form … just from the labors of ol’ Johnny Kline and Nell, practicing his good habits year after year. One man may sometimes strike a hard stone a good many times without breaking it; when another may take the same hammer, strike it in a slightly different place, or in a different way, and it falls to pieces. It may be that the first man’s strokes accomplished more than he knew of. The force of his blows may have diminished the solidity of the stone, and thus made it easier for the second man to break. If I cannot see much fruit of my labor here now, perhaps some, who will come after me, may. John focused his evangelistic attention on the neighboring counties. In addition, he usually made the trip to the annual conference of the Brethren. The conference was held at a different location each year. Sometimes it was close by, in Virginia, but more often it was in the Midwestern states. John would saddle up Nell and begin the long journey, preaching as he went. He would then return, preaching as he went. In later years, when the railroads were laid out, he went by train. The early journeys usually took a month, sometimes two. These travels became the means of his acquaintance with different congregations, and as a rule they were delighted when Johnny Kline passed through. John’s style of preaching was generally expository. Strong’s Concordance and similar study aids have given expository preaching a knock in the head. Today there is a strong tendency to look up a bunch of Scriptures on a certain topic and speak topically. In John’s day it was the custom to read off a verse, or perhaps several verses, and take off preaching from there. That minister who gets up and in a beautiful and glowing discourse sets forth the Christian “cleansed from all filthiness of flesh and spirit,” and then comes down [from his pulpit] to mix with the world, and follow its fashions and vanities, is cooking his turkey in the same water he washed it in. The professor of religion who, to appearance, makes a very humble confession of his sins, with seeming repentance and deep contrition of heart, only to go away and thrust himself again into the filthiness of his former life, is cooking his turkey in the same water he washed it in. In my travels among the mountains of our Virginia, I have often seen the laurel holding out its evergreen but poisonous leaves in sprays of most enticing beauty. Miles and miles of road, in one unbroken stretch, may be seen densely hedged on either hand by this beautiful emblem of sin and death. Herds of cattle and flocks of sheep are every year driven over these roads. Every herdsman and shepherd knows the danger to be apprehended from the inclination … to “sidle” off the plain and beaten track and pluck the green leaves of the laurel to their own destruction. The Prophet Isaiah speaks of some who “are drunken, but not with strong drink.” I fancy I hear someone in the congregation say: “I guess they must have taken laurel.” Precisely so, friend! They took the laurel that has been the ruin of thousands of the Lord’s sheep and lambs. Let me tell you exactly what I mean. The love of worldly pleasure is laurel of one kind. It blooms forth in the desire for fine dress, lively company, night gatherings, social parties, and the like things. Worldly treasure is laurel of another kind. It blooms forth in the desire for worldly possessions, no matter how obtained, and only to gratify selfish ends. I have known some old sheep to take this kind. With such practical, everyday illustrations, John was able to bring forth the rich treasures of the kingdom in terms the listeners could appreciate. John Kline did well among the mountain people to the west of his home. His real battle was to the east, in the flat lands of the coastal plain of Virginia. Here were the rich and politically powerful slaveholders. It has been unanimously considered that it cannot be permitted in any wise by the church, that a member should or could purchase Negroes, or keep them as slaves. This plain, simple declaration caused little problem in Pennsylvania, where most of the early Brethren settled. But once they began to move south of the Mason-Dixon line, it was culturally incorrect. And as long as the Brethren kept that conviction to themselves, it cost them little. They refused to hire slaves from neighbors, if the wages went to the owner and not the slave. If someone desired to unite with the Brethren, he was not permitted to do so until he had released his slaves, with the exception of those under age. In this case, it was determined to be better for the owner to raise the child, send him/her to school, train him/her in an occupation, and then officially release him/her when he/she became of legal age. Again, this caused little concern to slaveholders in the south, if a man wanted to release his slaves. But as the years passed by, some of the southern States began to make it harder and harder for slaves to be freed, until it became practically impossible to legally free slaves in some areas. What to do? The slavery question was splitting some denominations down the middle, with a northern version and a southern version. While many of the denominations did not like the idea of slavery, they were unwilling to stand up against the culture and declare it to be anti-Christian to force another person, against his will, to a lifetime of servitude. So they compromised, to be politically correct. Decide the question as to what the churches here in the slaveholding States should require of any slave owner desiring to come into the church. A very delicate matter to act upon in the present sensitive condition of public feeling on slavery. But it is the aim of the Brethren here not to offend popular feeling, so long as that feeling does not attempt any interference with what they regard and hold sacred as their line of Christian duty. Should such opposition arise, which I greatly fear will be the case at no distant day, it will then be seen that it is the fixed purpose and resolve of the Brotherhood to “obey God rather than men.” It was decided in council that every slaveholder coming into the church must give up his or her slaves as property; and yet not turn them off houseless and homeless, but allow them to remain, and labor, and be fed and clothed as usual, until suitable and lawful provisions can be made for their complete emancipation. In this we see the Christian response to a culturally acceptable sin. Not only were the slaves to be released, but they were to be released with dignity. And if releasing them would open them up to being recaptured and resold into captivity (which became a reality in some areas), then the release was done in such a way to help prevent this. For this reason, it was acknowledged that allowing the slaves the opportunity to continue working for their previous master as employees until they could legally be released would certainly be Christ-like. The point to keep in mind is that this option cost the slaveholder financially; he had bought the slave, and likely before he got his investment back he would start paying him prevailing wages and help him get a start in his free life. It would have been simpler to kick him out onto the street. That’s what happens when the kingdom of God breaks into an ungodly culture! This may seem strange to those of us who have grown up in churches where alcohol is never used, except medicinally. But in John Kline’s day, it was acceptable in most churches to sit down at the end of the day and have a beer. A totally abstentious church was rare. Not only did he never manufacture any, it is recorded of John Kline that he never even drank any alcohol, other than perhaps for medicinal purposes. They were now parted, never to see each other anymore. There was no hope left them of ever hearing from each other again. The gentleman said the little boys did not seem to mind it so very much; but, said he, the agony of the mother and the distress of the daughter were past description. It is to be hoped that such heart-rending scenes are not often to be witnessed; and I do believe that the time is not far distant when the sun will rise and set upon our land cleansed of this foul stain, though it may be cleansed with blood. I would rejoice to think that my eyes might see that bright morning; but I can have no hope of that. The year opens with dark and lowering clouds in our national horizon. I feel a deep interest in the peace and prosperity of our country; but in my view both are sorely threatened now. Secession is the cry further south; and I greatly fear its poisonous breath is being wafted northward towards Virginia on the wings of fanatical discontent. … The perishable things of earth distress me not, only insofar as they affect the imperishable. Secession means war; and war means tears and ashes and blood. It means bonds and imprisonments, and perhaps even death to many in our beloved Brotherhood, who, I have the confidence to believe, will die rather than disobey God by taking up arms. And war it was. The Brethren were acquainted with war in their history. During the tumultuous days of what is called The Revolutionary War, they had been harangued by sympathizers of the American forces for refusing to partake in the rebellion against Great Britain. In fact, the persecution was part of the reason for the emigration to Virginia and other areas. Their land and property had been confiscated in Philadelphia, so they left to look for new homes. Write to John Hopkins, to John C. Woodson, and to Charles Lewis. I can but entreat these men to stand in defense of our Brethren, and try to devise some plan by which they can be exempted from the necessity of bearing arms. I feel sure that if we can be rightly understood as to our faith and life, there will be some way provided for their exemption. The Brotherhood is a unit, heart and hand against arms-bearing. These things I make known to these men; not, however, in any spirit of defiance, but in the spirit of meekness and obedience to what we in heart believe to be the will of the Lord. Many have already expressed to me their determination to flee from their homes rather than disobey God. “Flee rather than disobey God.” It was this simple dedication to the will of God that made the Brethren strong. God gives grace to those who are willing to bear the cost of following Jesus—cost what it may. But to those who only have a form of godliness, with no surrender to do the will of Christ, grace will not flow to them. John’s letters and pleas paid off. The recipients of the letters were moved to write in a conscientious objector exemption in their draft laws. However, there was a $500 fine, plus a tax of two percent of the value of the goods of the person seeking exemption. The brothers set to work collecting the payments of those affected, and when some of the young men could not afford the fine, others in the Brotherhood helped them out. John Kline himself put up some of the money for the fines. In spite of official exemption from bearing arms, some local officials did cause the Brethren problems. John Kline spent time in jail on three different occasions, but was promptly released in each occasion. And when some of the young Brethren were caught trying to escape to the North to avoid conscription, John was soon at the jail to encourage them to stand true. On April 18, 1863, John received a caller … at 1 a.m. It was Abraham Funk, asking for his help with a man with a broken leg. George Sellers had escaped from the Southern army. He was part of a group of men making their way north towards freedom, by night, with some “help” along the way. Abraham Funk was one such “helper.” Leaving Abe’s house about 11 p.m., the group was walking along a road when the cry of “Rebel scouts!” went through the group. They quickly jumped into the ditch, not realizing that it was an embankment about 100 feet deep. Only George was hurt, with a fractured leg. We are keeping the whole matter a profound secret to save the life of a good man. He was taken back to Abraham Funk’s, where he is at this time receiving treatment in secret from me. About a month later, John left to attend Annual Meeting, reporting that George “is nearly well, and in fine spirits.” John Kline’s involvement in helping George was not a political statement for one side or the other. It was simply trying to help another human to live righteously, even if that meant going against the grain of the surrounding culture. Wherever the natural man goes, the natural passions and desires go. Wherever the kingdom of God goes, the natural passions and desires have to go … that is, leave! One natural desire of humanity is to be recognized as “somebody.” Pride is another name for it. What the person is “recognized” as varies, as some (usually women) want to recognized as pretty. Others (usually men) want to be recognized as tough. Some want to be “in,” others want to be weird, some want to be cool, and some even want to be recognized as superreligious—all by the way they dress. Jesus has another route. This route is to wear simple, utilitarian clothing that does not naturally attract the human eye as pretty, tough, “in,” “weird,” “cool,” or even superreligious—like the special robes used by some ministers—just for the looks of it. Through the ages men have called it plain dress, or simple clothing. In John Kline’s day, Methodists, Quakers, Mennonites, Amish, and Brethren all promoted the wearing of plain dress. In fact, from a distance one could not tell who that man on the horse was—was he a Methodist, or Amish, or a Quaker? All of them wore the same basic black coat with a split up the tail so that it would naturally fall over both sides of the saddle. On his head was his umbrella and sunshade—a large-brimmed black hat with a low crown. Since a man often could not know what kind of weather he may run into before he returned home, the hat was standard gear outside, as protection from hot sun and rain. In contrast, the general population tried to spice up their looks by flashing colors, feathers or a tall crown on the hat, big brass buttons on the coat, a sword on the side, a wig on the head, sleeves rolled up to show off the muscles … anything to give them some sort of special recognition in the flesh as tough, “in,” weird, cool, or handsome. John Kline and the Brethren simply used unassuming clothes that caused no special attraction to their flesh. Modest in cut, low-key in color, and utilitarian. Some sneered and some admired them for their simplicity; neither sneer nor compliment turned them aside. The Brethren did not try to “fit in” to society, nor were they trying to be weird—they were simply taking Jesus seriously in His teachings, in practical ways. They warned John. He felt it coming. In 1864 he made a trip to Hagers-town, Indiana to attend the Annual Conference of the German Baptists. Recognizing his leadership skills and supreme Christian character, for the last four years his brothers in Christ had chosen him to be moderator of the conference. Brethren and friends, let me say to you, that it is the duty, and not only the duty, but the highest attainment of Christian liberty, to be with Jesus and to give knowledge to all around that one has not only been, but now is every day, with Jesus. True godliness, however, does not desire to make a display of itself; it seeks no prominence in the world; neither does it aspire to receive the applauses of men. It does not ride upon the tempest of religious disputes, nor clothe itself with the whirlwind of fanatical excitement. But, like the divine Spirit from which it springs, it speaks in the still, small voice of tender compassion and love. Like its Lord, it enters the house of the humble, contrite heart, and would have no man know it; but it cannot be hid. Now, Brethren and friends, I have only touched some of the chords in the beautiful anthem of my theme. I now leave it with you, hoping that you may learn every note in it; and by the sweet music of a good life delight the ears and warm the hearts of all who hear its rich harmonies. Possibly you may never see my face or hear my voice again. I am now on my way back to Virginia, not knowing the things that shall befall me there. But I feel that I have done nothing worthy of bonds or of death; and none of these things move me; neither count I my life dear unto myself, so that I may finish my course with joy, and the ministry which I have received of the Lord Jesus, to testify the Gospel of the grace of God. It was May 19, 1864. The Civil War was raging. John had been given passes by both the North and South to cross the lines so that he could attend Conference. In those stormy days, the mere fact of crossing from one side of the lines to the other would be enough to raise suspicion—on either side. John knew his trip was a dangerous one. But a few days after his sermon, he took the train back to Maryland, where he then mounted on Nell once more and crossed the mountains back into Virginia, without incident. On June 15, John went on Nell a few miles and repaired a clock for a neighbor. While there, a group of young, Rebel cavalrymen saw Nell outside and called John to the door to ask him where he was going after he left there. They were neighbors … and John indicated that he would head straight over the ridge, for home. Did he realize that they were asking him so they could waylay him? We don’t know … but it is highly probable that he did suspect something fishy. He had been threatened already, and the day before he had warned a non-Brethren friend that this man’s life was in danger from Southern sympathizers in the area. Finishing the clock repair, John got on Nell and headed for home. On top of the little ridge, two men, Jake Acker and Joe Riddle, waited in the woods. Jake had been chosen to fire the first shot. After John passed by, Jake raised his gun for a moment, then lowered it. He could not bring himself to shoot the innocent old man in the back. “I can’t shoot that man!” he told Joe. “You ain’t no soldier!” returned Joe. And a shot rang out. White-haired John Kline fell off of Nell. Joe approached John, and seeing that he wasn’t dead yet, he fired another shot at point blank range, so close that it left powder burns on John’s clothes. Their dirty deed finished, the two men escaped. No one ever openly confessed to murdering John, but everyone in the community sort of knew who was responsible. Since the Brethren followed Jesus and obeyed Him, no charges were ever brought against the men. And since the Civil War still raged, the civil authorities were too occupied to worry about the collateral effect of an old preacher getting shot. Some of John’s neighbors had wrongly suspected that John was secretly carrying information to the Northern armies in the guise of his trip to Annual Conference. It is very likely that his stand against slavery and participation in war played into the circumstances as well. And so they murdered John Kline in cold blood. He was about his business for the Lord, doing his duty of blessing his neighbors. While he wasn’t killed for directly refusing to orally deny Christ, his adherence to the principles of the kingdom of God certainly led up to his death. Thus he belongs in the long list of those martyred for Jesus. Some time before his murder, Johnny Kline had written a poem about one of his fellow preachers, John Miller, who had died as a young man. Away from his home and the friends of his youth He hasted, the herald of mercy and truth, For the love of his Lord and to seek for the lost— Soon, alas! was his fall, but he died at his post. The stranger’s eye wept that in life’s brightest bloom One gifted so highly should sink to the tomb; For in order he led in the van of his host, And he fell like a soldier, he died at his post. He asked not a stone to be sculptured with verse; He asked not that fame should his merits rehearse; But he asked as a boon when he gave up the ghost, That his brethren might know that he died at his post. Victorious his fall, for he rose as he fell, With Jesus his Master in glory to dwell, He passed o’er the stream and has reached the bright court, For he fell like a martyr; he died at his post. And can we the words of his exit forget? O, no, they are fresh in our memory yet. An example so brilliant shall not be lost; We will fall in the work, we will die at our post. John Kline wrote these words about someone else, not about his own life. However, it is safe to say that John penned these words almost prophetically concerning his own life. Yes, indeed, Johnny Kline died at his post. A production worker earned an average of $0.06/hour at that time. $3.00 would have been approximately one week’s wage. The word “religion” did not have the negative connotations attached to it that some people now unwisely attach to it. Not referring to “indentured servanthood,” where a person of his own free will sells himself for a determined amount of time (possibly his entire life), usually to pay off debts. Indentured servanthood is essentially a long-term labor contract. On the other hand, anyone captured against his will and sold by another person is kidnapped, which Paul listed as a sin (menstealers-1 Ti. 1:10) right along with such sins as murder, prostitution, homosexuality, and lying. He uses “sensitive,” but not meaning they were sensitive in conscience, but that the subject was one that caused a lot of emotional feelings when talked about in society. Much like the topics of abortion and gay “marriage” are today. About one or two year’s wages. However, a good work horse was worth up to $1,000, so by selling a horse two fines could be paid. With the exception, perhaps, of the use of a beard. The Quakers and Methodists did not tend to let their beards grow, while the Brethren, Amish, and early Mennonites all generally wore a beard. The first Mennonites in Lancaster County, PA were known as “the long-bearded Swissers” by some of their neighbors. These two were not the only ones involved. Others had waited along another road in case John took an alternate route home. John had also been against secession of the South from the Union, but not so much as a political sentiment as much as for keeping unity and peace. I do not know if the young man actually uttered the words, or if John was writing in allegory. Originally published in The Heartbeat of the Remnant (September/October 2011), 400 W. Main Street Ste. 1, Ephrata, PA 17522.